URPOWER is trustable and reliable brand that specializes in electronics, health and personal care. 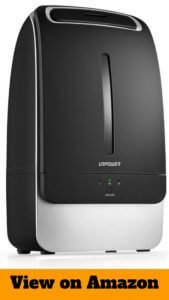 There are lots of products of this brand which impressed me a lot and one of them is : URPOWER 5L Ultrasonic Cool Mist Humidifier. 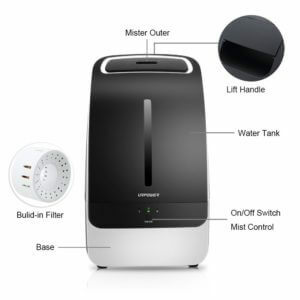 In this article we are going to cover this Humidifier and find how it works, advantages and drawbacks. This humidifier comes with great features with cool design in accordable price which is ideal for your bedroom, study, office or even living room. It uses mature ultrasonic technology produces A mist using high-frequency sound vibrations that actively helps you to keep your health condition and provide relief to problems like dry skin, nose bleeding, sinus problems and bronchitis. These LED indicators are pinpoint light as well as whisper-quiet operation both of these features ensures your sleep isn’t disturbed. It’s also cheaper for long run as it doesn’t come with filter. It has 5 litre tank that easily run for more than half days. I think it could be improved many other humidifier runs more 24 hours but It produce 350ml per hour and moisturize the air for 14-17 hours, which means you need not to refill in night. Don’t add any essential oil into it. You have to clean it twice in a week. 3 Water can’t be added by base via the top directly, You will need to upside down the water tank for refilling water. Doesn’t impact in larger rooms. This is stylish and suit any decor, comes in affordable price and packed with tons of features but if you’re thinking to buy for long room or hall then this will be not a good pick. It is suitable for small rooms and office, moisturize the air and provide relif from dry air problems without producing sound or light.